So I've kind of learned I have a thing for zombie stories. I think it's the mix of the apocalyptic sort of atmosphere and the tragedy. So much TRAGEDY in zombie stories because it's so EASY to get infected. And there might be some other deeper psychological reasons (that probably point to me being slightly nuts), but in any case, I was delighted to finally have a chance to read Mira Grant's Feed this past week. Which was awesome! Feed takes place 25 years after the virus first broke out, so the world definitely has coping mechanisms now and zones of hazard and safety and all sorts of laws against big animals and taking like, 4 blood tests a day is completely normal. But what's really cool about this world? Bloggers are huge! The zombie outbreak was so mishandled by traditional news outlets that bloggers became the go to people for reliable information. And they've organized themselves and they have classifications and licenses and all kinds of stuff like that. Pretty awesome. So our main character, Georgia, is a blogger, called a newsie. This means she hunts down the truth and reports facts as best she can. Georgia has an adoptive brother Shaun and these two are TIGHT, as Georgia says at one point, codependent. Not in any sick gross way, really, just that they are totally and completely comfortable with each other, they know each completely and trust each other that much, too. Shaun is the more adventurous sort (called an Irwin! )..he likes to go out in the field and taunt the zombies for amusements sake. What this means is that Feed can be enjoyed on many levels. If you really like political thrillers it's a bit of one of those. If you love blogging, you're not going to top this. If you love close family relationships in your book, you've got that. If you like zombies...they are very present. Feed has a lot going for it. What I loved about this book was the world building was so good! The explanation for the zombie virus made a lot of sense. The way the world recovered and moved on was fascinating. The fact that EVERYONE carries the virus in them and it activates on death is so rich with meaning I loved it. Using blogging as such a huge part of the story provided a glimpse into how a zombie's craving for flesh is a bit like our craving for information. And the fact that San Diego Comic-con got a mention was super cool because I saw Mira Grant on a zombie panel there and she was delightful and funny! 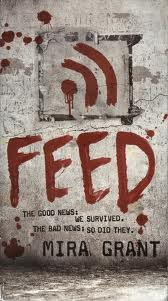 Feed is told in first person perspective. It is not in any way a romance. There are zombies. There is death. The dead rise again...but only to eat your brains. There's a lot of action and a lot of mystery. And the biggest compliment I can pay it is that when I wasn't reading it, I was wishing I was reading it. And Mira Grant is also Seanan McGuire who writes urban fantasy!